Your Local Source for Hunter Douglas Window Treatments, Custom Draperies & More! 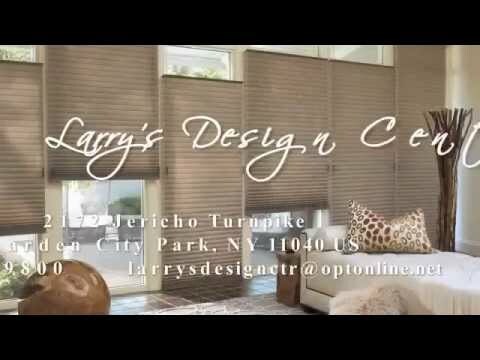 Since 1951, Larry's Design Center has proudly served the window fashion and design needs of homeowners and commercial clients throughout the New York City and Long Island areas including, Nassau County, Suffolk, Queens, Manhattan and Brooklyn. From high quality Hunter Douglas fashions to custom draperies and upholstery accents, our window treatment and design experts will help you select the perfect option that achieves your design goals and fits with your budget. We specialize in a large variety of window coverings including blinds, shutters, shades, sheers, and drapery, as well as motorization solutions and custom upholstery. Here at Larry’s Design Center we also offer a wonderful selection of window treatment services, such as cleanings and alterations. Our team of expert seamstresses can change the size or design of any curtain or window fashion with beautiful results. Additionally, we offer an on-site dry cleaning service for both fabric window coverings and blinds that is guaranteed hassle-free. Experience the difference at Larry's Design Center – stop by our gallery showroom in Garden City Park, NY, to see our full-size displays and browse the latest window treatment choices in a variety of styles, fabrics, textures, and colors. Our window treatment ideas are sure to inspire. You can also shop our extensive window treatment catalog online. We're looking forward to serving you! Stop by our gallery showroom in Garden City Park, NY, to see our full-size displays and browse the latest window treatment choices in a variety of styles, fabrics, textures, and colors. Contact us for an appointment today. We're looking forward to serving you!